A dynamic and efficient Government agency committed to promoting sustainable hydropower for socio-economic development in pursuit of Gross National Happiness. •	Govern and facilitate integrated, regionally balanced and optimal use of water resources for development of hydropower with minimal environment impacts. •	Ensure that hydropower exports generate maximum revenue for the Nation. •	Ensure secure, reliable and affordable energy for the domestic consumers. 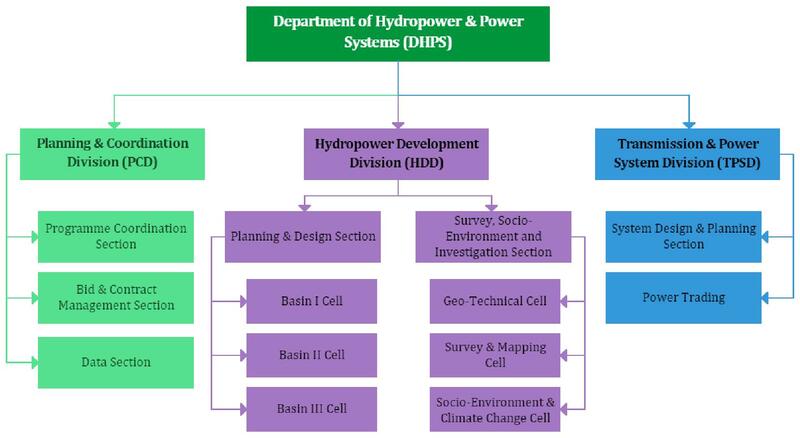 •	Provide enabling environment for participation of public and private sectors in development of hydropower resources. •	Implement Institutional reforms for efficient planning and management of the sector. •	Develop and enhance professionals in hydropower development and management. Hydropower is a Strategic National Resource and main driver of economic growth. 1. It shall drive the economy of Bhutan by providing, safe, reliable, affordable and abundant electricity to improve the lives of all Bhutanese and drive industrial growth. 2. Surplus power shall be exported to enhance government revenue and achieve positive balance of payment.